Many, many years ago, in fact, before we all had computers, mobile phones and bread machines if you can remember what that was like, I taught classes in Vegetarian Cooking. Having limited photocopying resources, I wrote all my recipes into a cookbook. It was "self-published" and sold through the classes and only ever in a couple of local shops. But people bought extra copies for presents for family and friends. 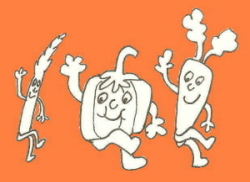 The book is called "Dance of the Vegetable Patch", and contains basic vegetarian recipes, keeping in mind that it wasn't that common to be vegetarian "way back then". So ever since then, I've been threatening to do another one. I put it on my list of goals for the year. But I've done this for about five years. I have made a start - taking photos of food, developing and writing out recipes. But I don't really know if I'll ever get it done. So for now, I'm putting recipes onto this site. Some will have photos. Some may be from the old book and have my old hand-drawn pictures (when I get around to some serious scanning). Please use these for personal use only. Keep the copyright notice attached and share them with others. Email me and tell me which recipes you like. Send me suggestions for vegetarian dishes you'd like recipes for too.